I have recently tried two laser resurfacing treatments. As I am based in California, I am very concerned to use products that protect the skin against UVA/UVB. And more importantly, after a laser treatment, I needed to find the adequate and most protective sunscreen. I eventually find out Skinceuticals products. I knew the Skinceuticals brand as it is a paraben free brand which is sold in natural high-end beauty stores. After a laser treatment, it is very important to protect your skin with a sunscreen and a hat. I usually use the Coola sunscreen but this time, I wanted a sunscreen recommended by dermatologists after a laser treatment. Skinceuticals Sheer physical UV defense SPF 50 and Physical Eye UV defense SPF 50 (your sunglasses are not always enough to protect your eye area) are tested suitable for use after a post-laser treatment. 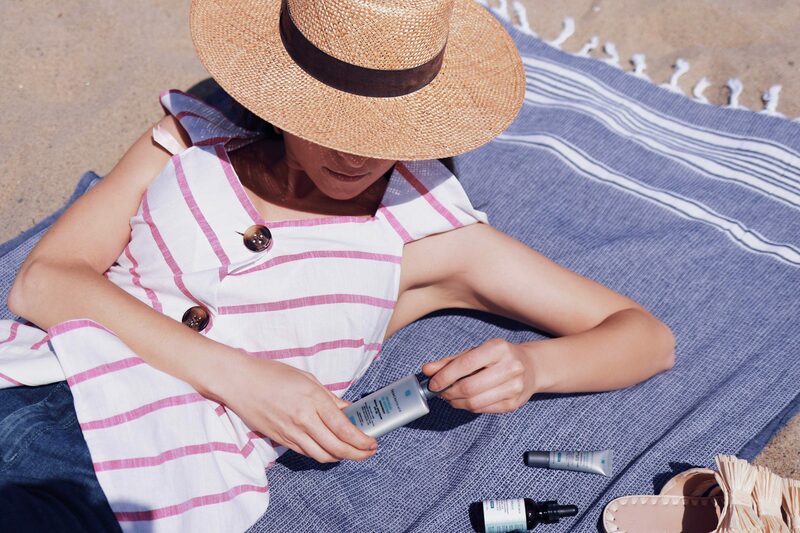 SkinCeuticals daily sunscreens provide a high level of broad-spectrum sun protection with chemical-free UV filters. All products developed by Skinceuticals are paraben free. So if you want to be sure to have a very protectective and gentle sunscreen, try Skinceuticals. It should be noted that your skin will love vitamin C after a laser treatment. Indeed, a vitamin C serum helps neutralize free radicals induced by UVA/UVB, infrared radiation (IRA), and ozone pollution (O3), which may lead to visible signs of accelerated skin aging. In addition to antioxidant protective benefits, C E Ferulic serum by Skinceuticals improves signs of aging and photodamage, the appearance of lines and wrinkles, and the loss of firmness, while brightening skin’s complexion. (Source: Skinceuticals). Note, that after a laser treatment, your skin is very dry and sensitive, so you should avoid using your usual anti-aging products (such as retinol). When I did my first laser treatment, I was advised to use Aquafor or Vaseline. However, I don’t like using petroleum products (they did clog my pores). So, for the second treatment, I used aloe vera to smooth my irritated skin during two days. On the third day after the treatment, I used the Skinceuticals C E Ferulic serum. It contains vitamins C and E and Ferulic acid. I can confirm that my sensitive skin totally supported this combination after the treatment. As I am very concerned by the eye area, I tried the AOX Eye gel which also contains vitamin C and Ferulic acid. I have been using these products for two months and I am totally happy with the results. I am not a dermatologist but I wanted to share with you my journey, as I was concerned by sun damages and I found a great solution. It is not always easy to find good and effective sunscreens. So as a beauty enthusiast, I will totally recommend Skinceuticals to protect your skin from sun damages. However, if you have any doubt, consult a specialist. As a disclaimer, I received the products for free with no obligation to do a blog post. I’ve never done any laser treatments, but I’ve been considering them for some time. It’s good to know exactly what products to use if I were to ever get them done! Thanks for sharing! Let me know if you have any questions about laser treatment! Really good tips! I don’t like using vaseline or aquafor either! Love your sandals babe! This is great information! I haven’t done laser treatment yet but I’ll definitely be keeping this saved so I can be knowledgeable in the future. I currently use a vitamin C serum and love it so it’s good to know I can use it then too. With or without laser treatments, I always see to it to apply sunscreen. It’s a must-have. I’ve never tried laser treatments but I never leave the house without applying sunscreen. SPF is so important to me! Great post dear, it‘s so important to protect your skin against sun! Will check Skinceuticals out! Thanks for sharing! X C.
Thanks for sharing these fab finds. Some of these are new to me, but I may be adding them to my skin regimen. Your sandals are so cute! And I LOVE your top! Thank you for all the sunscreen tips! Sunscreen is definitely a must, I try and apply it every day! So good to know! I am using tones of sunscreen too, I will try your suggestion of products!